Badgers fans, check out our prices on a Kohl Center suite! 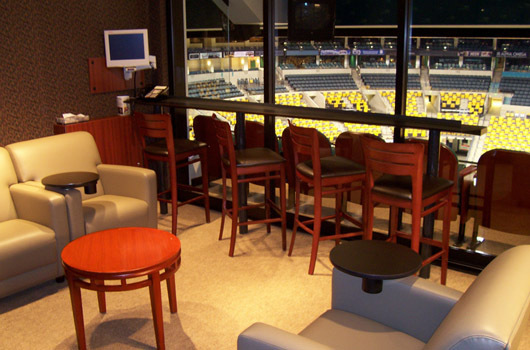 Whether you enjoy Badgers basketball or hockey, you can watch the games in style this season. Sit at the blue line in a suite that seats sixteen people. Suites include private restrooms, closed circuit television, and catering services. Keep in mind that food and drink are extra. The purchase of a suite for single games is what we are talking about, and it's not too often that Badgers fans get the chance to do just that. We are talking about the ultimate in comfort. Wisconsin students make up most of the staff that will get you settled in to the suite. From there, the fun begins. It's best to check out the food menu options well ahead of the game date. Check with Ann@TicketKing.net if you have any questions about pricing, amenities, and availability. This offer doesn't come around that often, and games are selling fast.